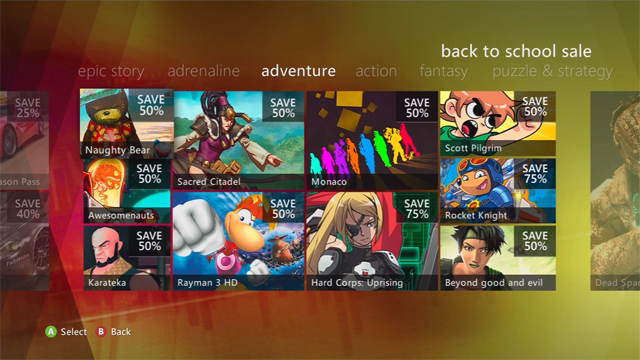 Microsoft is taking some of the sting out of the returning school season by offering up a ton of great Xbox Live Arcade content at deeply discounted prices. Starting today, you can score some hefty deals through the Back to School Sale, which halves and quarters the price tags of over two dozen titles until next Monday, September 9. Snag your favorites from the list below, but remember these titles may vary and might not be representative of your region. To check out more about each game, hit the title link. If you’ve already made up your mind about a must-have addition to your digital gaming library, you can go directly to the purchase page by clicking the discount link. Happy hunting.